I love your Jane Eyre photo! Oh I LOVE your post!! And how you've reframed the shot (more pigeon - I like it!). It makes me laugh just thinking about it, and how gutted I was at the time for that stupid bird ruining my picture. Your orange photo is amazing, that's so funny, you've surpassed my expectations on what I knew would be a wonderful 'fun' take on things. Wow. I totally love how you rock the mustard color tights & hair scarf. Adorable. Oh Roz that first photo is simply wonderful!! I think you have to have fun with fashion, you have to have fun with everything otherwise life would be very dull indeed! I actually just found the most hilarious shoes, they are a black velvet mens slipper with embrodery, a 'screw' on one foot and a larger letter 'U' on the other!! Such a shame I can't get them into the UK without a huge shipping and import charge or I would snap them up in a heartbeat. We could all use some more laughs and humour in our lives! wonderful post! I love the first two photos so much. So jealous that you got to go to LFW! I totally agree to everything you said in these first paragraphs of this post. And man, you look awesome! Love the first pic! picture number one... sooooo funny. i laughed out loud. i love love love it!!! I think fashion can be so many things. I don't like to put it in a box. It can be art, and it can also be fun. I don't like to take fashion so seriously. I love runway shows, and reading small blogs of people just discovering their style. Your outfits are really beautiful. I love your use of yellow, and orange. I like the little detail of the orange eyeshadow. Hey Roz, it was lovely to meet you...sorry it was just a brief meeting. Your styles are impeccable and envious. The dog in the bag in the Jaeger show belongs to my blog friend Kristin Knox of The Clothes Whisperer. The dog is called Butters, she's a cute little thing. my philosophy is that fashion is more design than art. that is to say, it's not a "fine" art but considered an applied art. you have an eye for whimisical fun! more posts like this from time to time are definitely in order. 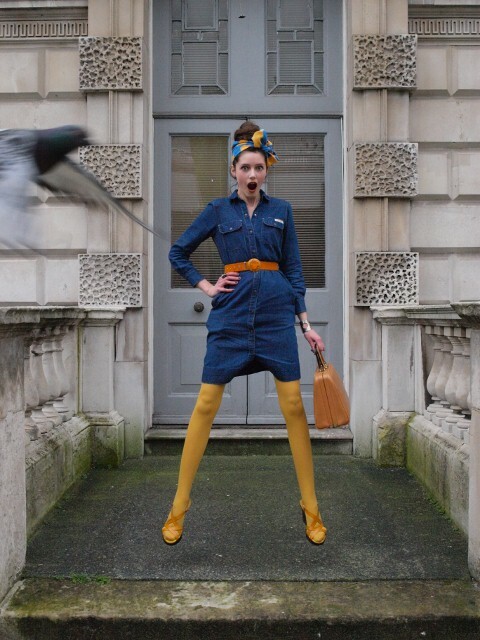 i love how you've added mustard yellow tights to the calvin klein denim dress! and the all-orange is totally charming, right down to the orange eye shadow. also, well done on the LFW photo- the little dog is definitely unexpected on the runway. Great outfit! Your dress and scarf are amazing! I absolutely love these playful shots of you!! If fashion is about the joy of mixing, matching, designing and creating, then there should be a show of fun too, I think :) That's my 2 cents anyway. Great post - love your writing. Love your thrifted orange cardi. A couple days ago, I complained to my mom that I tasted the most un-orangyest, imported oranges this season. the bird thats flying into the image is the coolest thing. this is the best image ive seen in a while! That denim dress looks so amazing! We all have to wear clothes everyday like it or not so we might as well have fun with them! I think that fashion is definitely a form of art too as designers put so much time and effort into their collections to create them to the same level of perfection they envisage in their heads. Maybe fashion isn't necessary - but then you could argue that most things aren't. It makes up our culture (in Britain) and other cultures around the world - think how many fashion weeks their are in the world! You look marvellous! I love this colourful outfit. What a great post. Well written and edited. I'm still speechless about the first picture. The first image is so wonderfully playful. Reminds one of fashionable birds flying high in the sky at London fashion Week. I adore the tights and head-wear. Oh that first photo is incredible - the pigeon swooping in on the left! Magic! Pearl summed it up very well, life has to be fun, fashion included. What a waste if it wasn't! Great shot of the jump, love the pigeon! Love the second photo escpecially the hand brooch! P.S. : You look so (prettily) different with your hair up! these are perfect, I love how you look a bit vintage (but in a classic rather than a throwback way), with a whole lot of fun sprinkled on top! great one! This is such an inspiring post! It is definitely my favourite post of yours I have ever read, the first shot is magical! 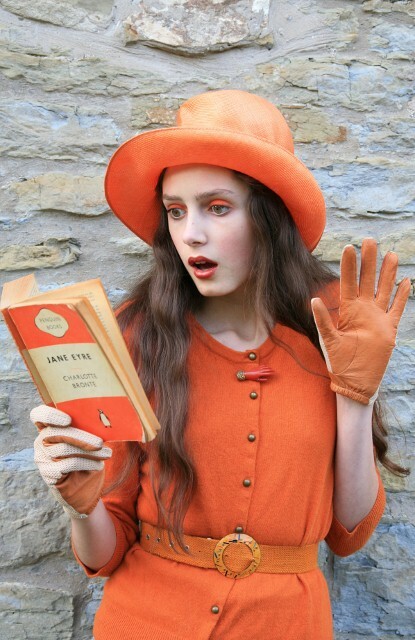 I adore your "orange" photo, using Jane Eyre is such a brilliant idea, I have a feeling I may be stealing a few ideas from this post! It sounds like you had an amazing time a LFW, I really wish I could have been there. I thought you had to be 18? Anyway, I cannot wait for your next post. I agree with everything you say Roz, and it does annoy me when people snobbishly assume that fashion is shallow or stupid. Does anyone say the same thing about men watching football? One could sensibly argue that it has even less relevance to reality, and fills no real function. I absolutely think fashion is a form of art that incorporates both function and creativity, and I love it for the fact that no matter who you are, you can enjoy fashion in your life. It is really one of the most egalitarian forms of art. OMG you're SO ADORABLE. You're like the perfect model. Love it. Love the scarf in your hair. What a fantastic shot! And you wear the best color combos,no less. I swear I get more and more impressed with you. As for the orange= brilliant. The eye make-up is crazy but gorgeous you pulls it off. GREAT ensemble, and I loved Jane Eyre! I love that first photo of you! I think fashion is all about having fun and dressing up. It is certainly an extension of "play" from childhood. Really cute outfit with the yellow tights. I like your style. i love that first photo, it's so fun! Great Post, I adore the first two pics, they are AMAZING. Jane Eyre? Can't say I liked it, but what I loved is "The Eyre Affair" by Jasper Fforde, who makes great use of Jane Eyre. It's one of my favourite books ever. Thanks for the book tip of "the thoughtful dresser" just added it to my amazon wishlist. And over 30 hats in your collection? I so do envy you. ;) I only own 3 hats and 4 caps at this point and one of it is a base cap. Mmmh. Anyway I think you make lovely use of your hat collection and blog and thanks for the reminder that putting outfits together is actually fun. Love, love that first photo so much. Wowwwwwwww you are tall and really beautiful my dear Roz. Such beautiful outfits all the time!!! I'd totally seen these going around tumblr and now I know the source! I'm glad I found your blog!! woah! just discovering your blog, where have i been? !- i do believe that fashion is an art like the others you mentioned and there's tons of room for expression and different genres: romantic, edgy, dramatic and definitely humor. I LOVE the first picture :) You look amazing! i am very in favor of coordinating one's clothes with one's book of the moment. you really don't want to clash with your reading material.